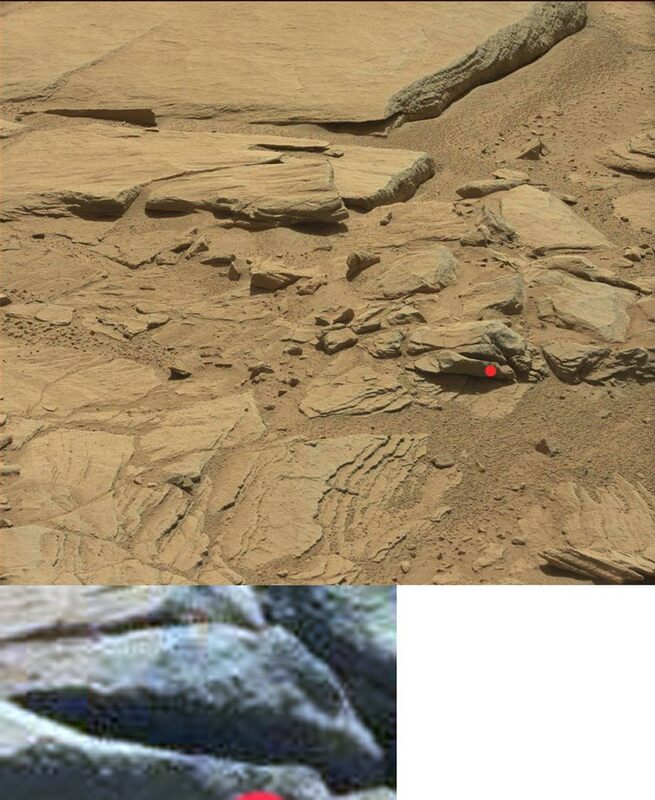 Hard to say if it is the rover, ref, or a plant or both, but part of this ref, rock is probably showing us plant life of some kind. Not a bad image of the rover. 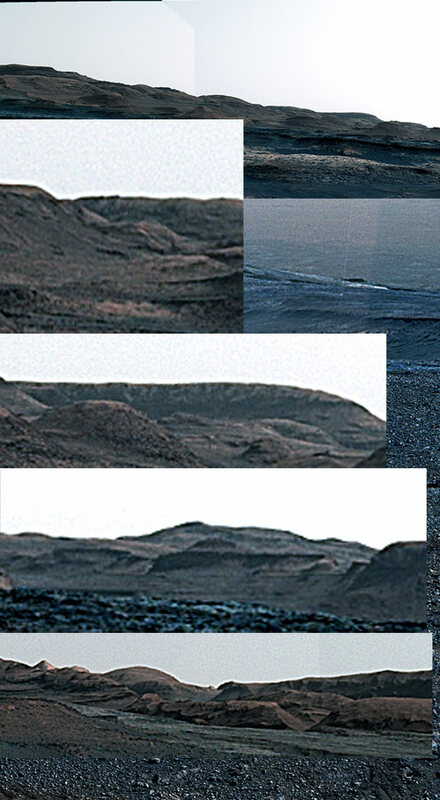 Ok first image shows the rover, (middle arrow) possible shrubs, and something white between the hills and rover, (mist best guess). Bottom image, an eagle, flapping its wings, perhaps? Mars sun is still setting, right image shows a white sun, with orange, pink and possibility green clouds. Left, the top white thing, is the rovers robotic arm, below that are obvious green hinted clouds with a white sun below that, and on the right distant blue mountains and a forest of some kind on the far right. CP shows strong lime green, and considering that the trees and forest base are all showing strong green colors in what looks like a lower part of a valley, have an ample water supply. 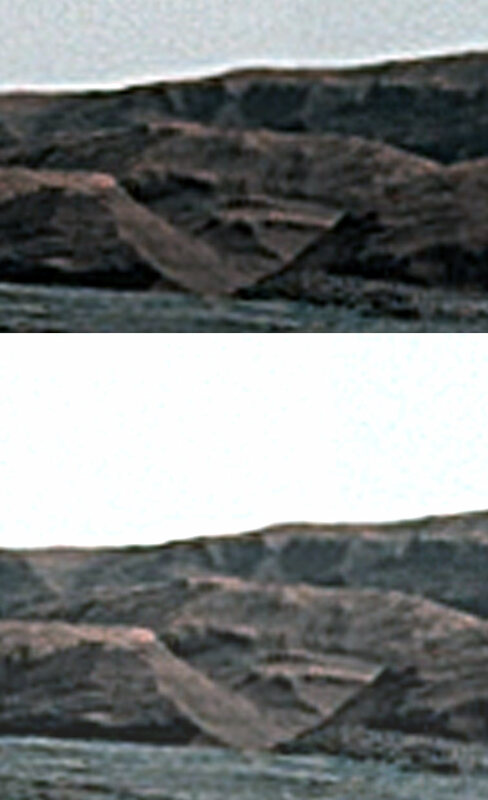 This isn't the rover as that is white, and the green clouds couldn't change the color that much, (especially since l glimpsed the rover in the last few images with zero green on it). Just another image confirming that Mars is the second habitable planet, (that we know of, there may be another) in our system. 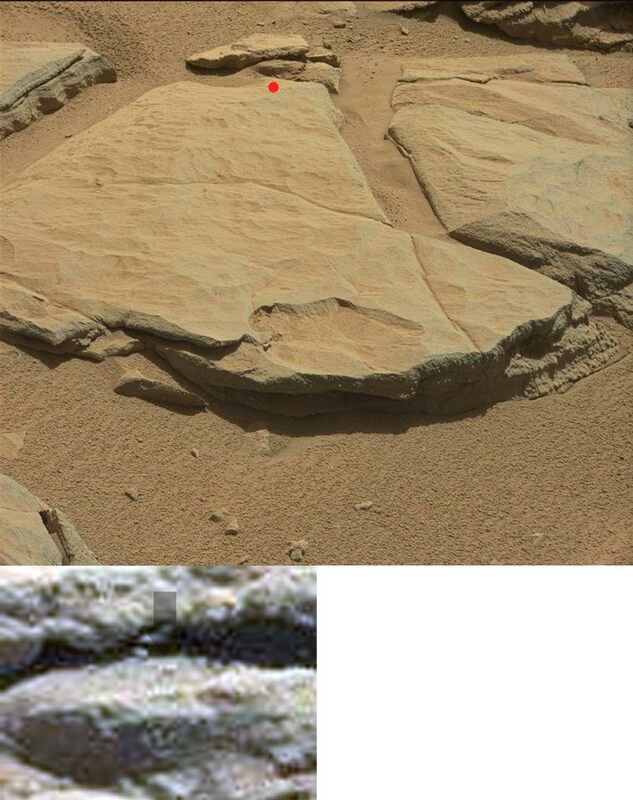 A weird looking "rock" but with what looks like a linear script of some description. A great find! Tree, sculpture or old power line towers, being ref, back to us, but l agree intriguing. Sun still setting and plenty of small plants about. Probably the best one, with blue hills and small shrubs or plants going into the distance. Lower image shows this plant with the big leaves, which appears to be a sculpture of some kind? And the thing on the right, that appears to be an old piece of silver junk, obviously artificial and not the rovers wheel, (although it is ref, part of its wheel on the left). Ok, special occasion today, since this thread has got over the 60,000 views barrier, (59,000 was the highest l ever got elsewhere). So a special thanks to the mods here and of course members who keep coming back to see the true reality of our nearest neighbor. So, l tried something different today and went from the most recent to Sol 2119 and 2123, trying to find more traces of rainfall on the rover. Which l unfortunately couldn't find, but l did find these, or traces of rust on the rover, (it has been there for 5 years and gone through rain and showers day and night). First image shows a rusted, moving part that should, (if NASA is right about no rain and virtually no atmosphere) should be close to reflective silver. Tip may be rusted, but hard to tell with the lighting and NASA's BS orange/red filter. 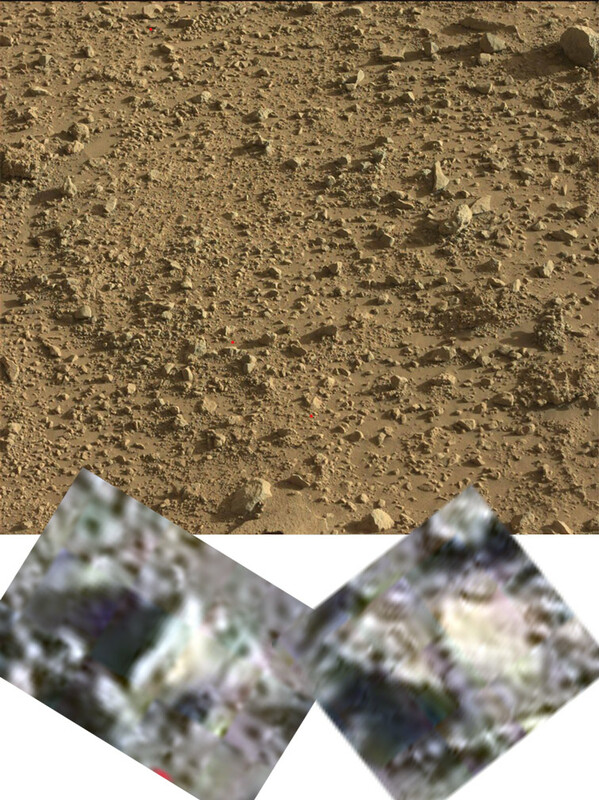 The next one, (Sol 2119) shows the rust a lot more clearly, hard to tell in the top, BS NASA image, but make it true color and it becomes obvious. The components in the foreground are most likely aluminum and the flexible, rusted material behind that, probably thin tin. 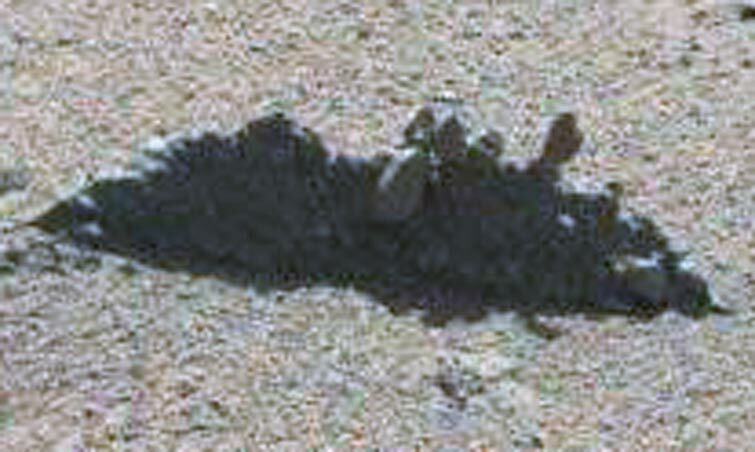 I suppose that when the rover starts falling apart, NASA will say that magical bacteria from Earth are responsible, lol. The error corrected colorized images are quite a bit closer to the real deal for sure. Yep, and the color corrected one, also shows an overcast sky with small indications of the blue sky peaking through, (left and right edges). Found this today, an advanced robotic type lizard creature peeking over the rock? Don't know, but it doesn't seem to be associated with the rover. There are so many strange objects that have been observed on Mars that I don't think one can simply dismiss the hypothesis that there was a catastrophic event that destroyed an ancient civilisation on Mars, leaving a fairly dead surface and a debris field. But what sort of catastrophe would match that hypothesis...? Thinking back to the Apollo fire, I was wondering if you had an atmosphere on Mars with a critically high level of oxygen and then a large asteroid passed through it made of combustible materials (presumably a lot of carbon included), breaking up on its trajectory, could that cause an immediate global conflagration that might consume nearly all the atmosphere, so killing off virtually all the biosphere (but maybe allowing some life to continue in cave ice and water etc)? Any thoughts as to whether such a scenario could be realisable? From what l have read, Mars had an Egyption type civilization on its surface a long time ago, (half a million years without checking) and an asteriod passed by Mars but was so close it grazed its atmosphere and set up a resonance, (throwing a pebble in a pond) that allowed its atmosphere to dissapate away, so some sympathec aliens put them here, and,...well, not sure after that but most likely they repaired its atmosphere and took residence there. The debris everywhere, was probably part of the great war we had with the Atlantien and other superpowers on Earth 12,000 years ago, (old machinery is still in orbit around the moon, and on its surface). Well the resonance idea is interesting...if the asteroid was big enough and Mars is turning more or less 24 hours per sol...I could see how soimething like that might happen...I guess we would be talking about the plasma from the asteroid pushing the atmosphere off the planet. That doesn't seem completely implausible...the rest is rather wild speculation I would say. Certainly for the hypothesis to work, it has to be a super catastrophe but such super catastrophes do happen. It's just I am not sure people have thought about what might happen to planetary atmospheres in such scenarios. I hope you members will not find me to be a disruption. Here is an alternate story about an alien race that destroyed a bronze age civilization on Mars with nuclear detonations. Perhaps ~300 Million years ago. To a degree this would justify a cover up, as knowledge of such a thing might traumatize human cultures on Earth. I do not affirm or deny it. Nothing is proven. That is why we need to really study Mars. Should Earth "Civilization" collapse without the truth being shown, then it would be a real pity, as such a fallen culture would likely have many falsehoods in its stories, and that and the fact that the mineral wealth of the Earth would have been largely consumed, might make it impossible for a rational human civilization to rise again that could be space faring. Humans may have only this one chance of the next 20 years. =Void I hope you members will not find me to be a disruption. 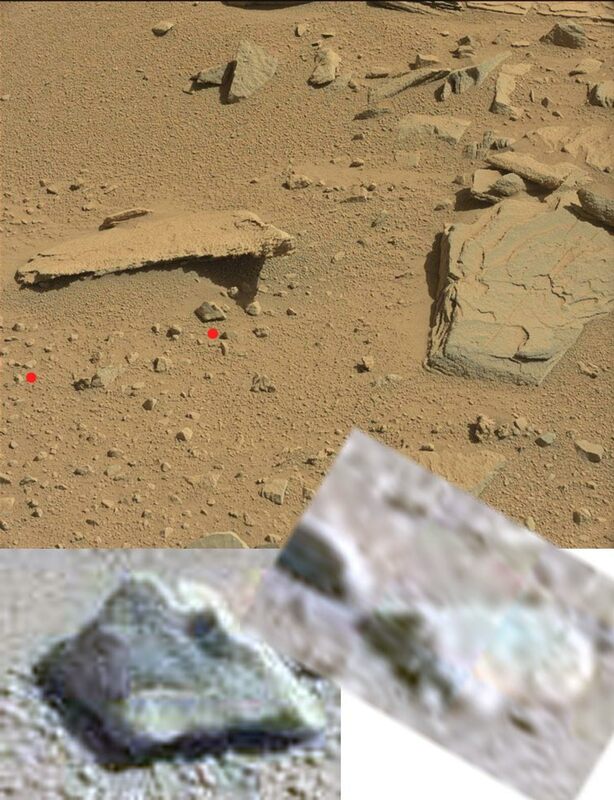 Yep the first link is more likely, and would account for my findings over the years or artifacts on Mars and how well they are preserved. Planet killers, if the Russian one was placed at the bottom of the deepest part of the ocean it could create man made earthquakes that could cause widespread disasters. But sure drop a monster nuclear weapon from space that could cause a nuclear winter, possible. No surprizes about landing Viking away from the ancient town, been doing that ever since. If a big enough asteroid grazed our atmosphere then it would send shock waves throughout our globe that could result in the atmosphere seeping into space, which would or could wipe us out. But l agree the rest is what l read. 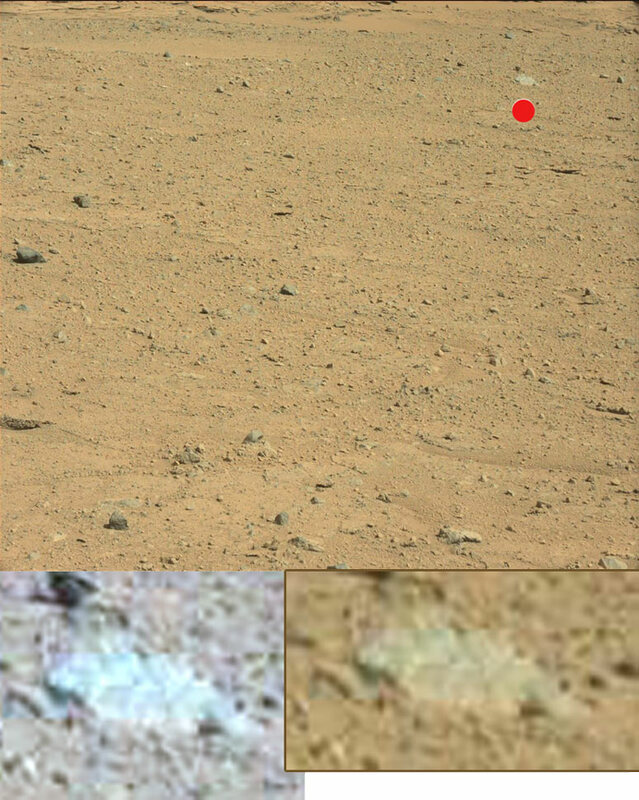 Ok, this one is more solid evidence that NASA is lying. Their dodgy image on the right, shows an orange sun, setting on a brown landscape with a greenish sky, (obviously not the all blue sunset ones NASA spew up). And the one on the left, white sun, gray landscape and blue sky. 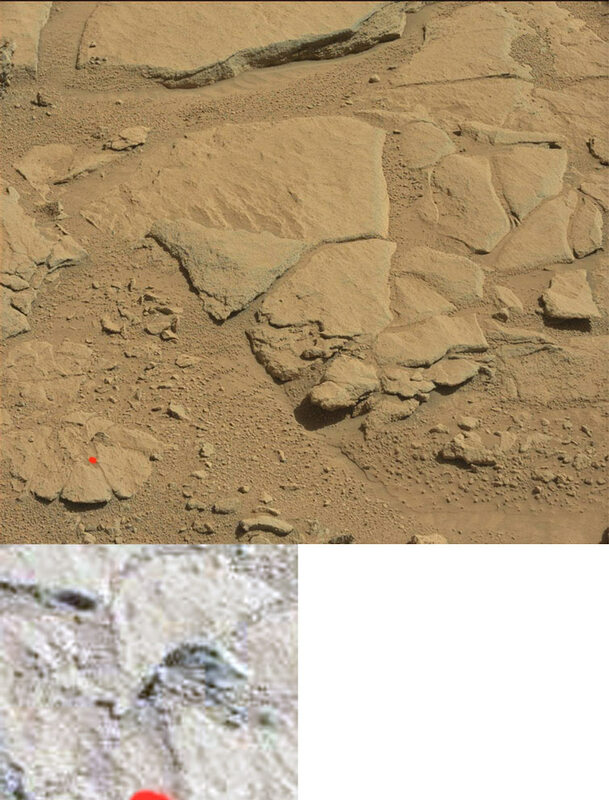 And this, Viking was reported to have found organics in the soil, here you go...(obviously not viking, but still on Mars). The soil is a little damp, and as the CP shows obvious traces of lichen or moss here and there. Viking would only need to scoop up one of these pieces of organic samples to get verification. But they intentionally botched the oven experiment, and the mindless masses accepted it, even though no images were taken of the dirt being released from the landers oven, (something they could have easily done). Some want to believe that Mars is a dead rock, and will only have themselves to blame when this gets realeased in one hit, (which will happen soon enough). Revisited this one again, or the artificial thing down the bottom. This cone is hovering above the surface, and l later realized that it is attached to the rectangular type object behind it. Best guess that this was a door stop or handle for a door, or maybe part of a mirror or furniture. The links before mentioned that the disaster or war happened during their bronze age, but bronze age and atomic weapons? Likely if it is was 12,000 years ago, Atlantis had very advanced concepts inbetween ancient technology, (a bit like a caveman with a torch). And Indian records clearly show atomic weapondary was available, as well as antigravity. 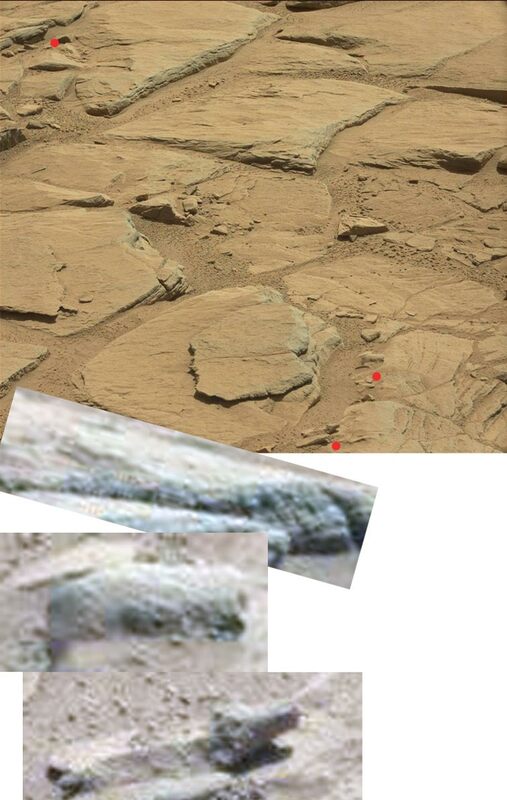 But ok, this thing isn't bronze as that has a copper look, and there are plenty of martian rocks about with a silver look, so silver appears to be the dominant material back then. Couple of stunning videos on Art Alien TV. I particularly like the strange object at 17:10 - looks like a twisted mass of metal pieces...machinery? a bracelet? a charm? a rock? a rock!!! probably the last thing you'd say!! What to make of the gold beetle at 1:30? The gold bettle is the sun reflecting off of a rock, (probably at sunset considering the gold color) metal, if it was it has been melted by an explosion. But the faces, is the best one, three faces in the same place, so it being an anomoly is probably unlikely, and even with the bottom part reflecting the lanscape back, l can make out a monkey on the right and a human in the middle, nice one. The gold beetle is the sun reflecting off of a rock, (probably at sunset considering the gold color) metal, if it was it has been melted by an explosion. The shadows don't suggest sunset and there is no gold in all the other light points. Yes, very interesting...I am going to go back to his other video and take a closer look at the raw image. Sun still setting and a plant or sculpture in the middle of the left image. Right hand image shows an overcast sky, green landscape and maybe some tree's here and there. 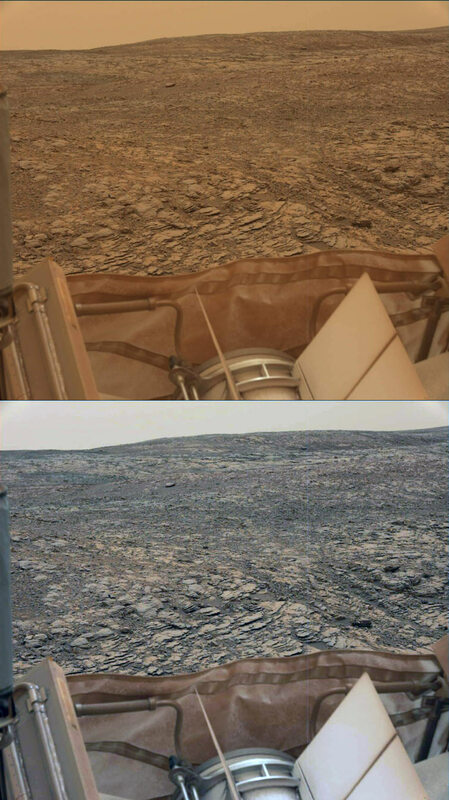 Ok, something different today, it seems that Curiosity actually or finally took a high res image of Mars, or more accurately a panoramic image. This is around 300 meg's so it will take a while to load up, and a while to download, and may crash some computers, although my one is high end, as has a hard time crashing. Correction l have an i7, 16 megs or ram and first try while trying to save Photoshop crashed, second time it got through, although l missed a few images and lost my markers. I will post them here soon, but be warned this is a mongrel image to work with. Ok, here it is, with plenty of artificial things about and possibly some ancient things. Most of these anomoly's were found near the top of the hill, on the left and middle, although the carved out hill with the structure behind was on the far right. 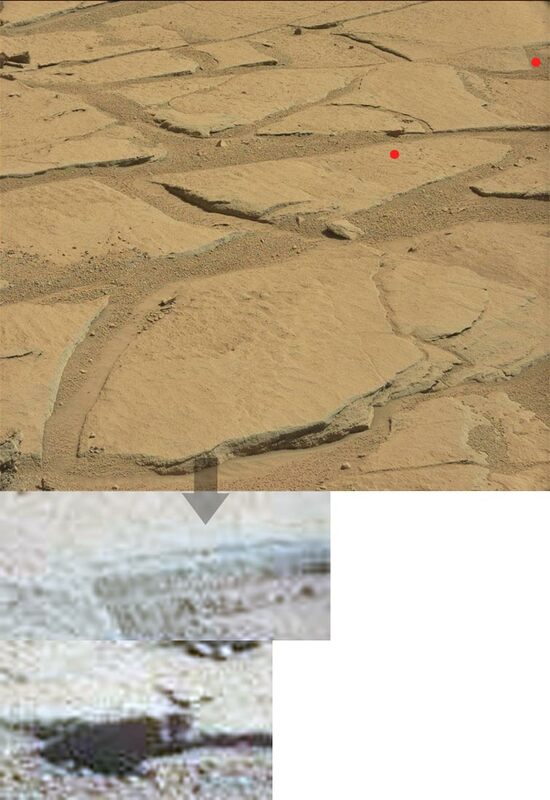 First, (top) is this thing on the side of the hill, which is an advanced structure and isn't the rover being ref, back to us, (background is visible behind the dwelling). But considering the weird angle, more likely some industrial type scructure, air intake, water pipe, etc. Next on the right, the sun is shining off this, which considering that this is very shiny, could be a waterway. Next the top of the hill is warn away, but in a way that suggests that a forest of tree's is growing up this mountain? l have found some traces of green, but mainly found blue, so hard to tell, but l like the forest idea. Next this area collapsed, but did so in a way that suggests that water did so. Last one, this area of the hill gone, through deliberate removal, so the water outlet can disperse water. This may be ancient, but this definitely isn't the rovers reflection. 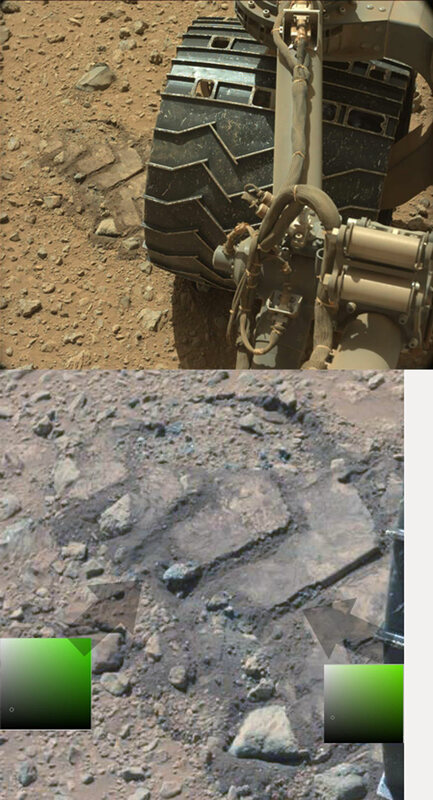 Hard to say if this is metallic or carved into the solid rock, but either way not the rover, and not natural. Very interesting image. Certainly looks highly anomalous. Tmcom POST 647 one of the images looks like its a lake with Nesse swimming around in its locke ness.